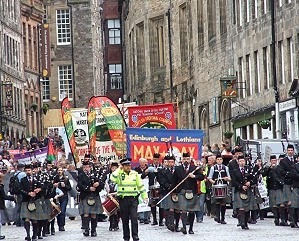 A great turnout at Edinburgh’s Mayday march and rally today heard Owen Jones call on the labour movement to give people hope and defend the NHS, the welfare state and all that was won by ‘struggle and sacrifice’ in our history. “We need to give hope to those who get up in the morning to go to work to earn their poverty. We should say that if you are in work the least you can expect is a living wage”, he told the packed rally at the Pleasance theatre. The money is there. Governments can always find billions for war, to bomb and to kill but they tell the disabled they can’t afford for them to have a so-called spare room. They demonise those on benefits by talking up the £1.2 billion wrongly claimed, and doing nothing about the £25 billion lost in tax avoidance to the richest. We need to give hope in housing. “There are five million on housing waiting lists. One in four homes are overcrowded. We need to control rents and give councils the power to build a new generation of council houses”, said Owen. This would not only house people, it would create jobs and build the economy. And we need to tackle the ‘politics of envy’. Politics that, instead of tackling the big businesses that have squandered private sector pension schemes, they convince private sector workers that public service pensions need to be cut in a race to the bottom. Politics that have managed to create a myth that it was public spending that caused the financial crisis rather than the banks. He pointed out the Tory success in burying the fact that they backed all of the Labour government spending up to 2008. He praised Bob Crow for the organising work that saw the RMT grow in membership and tackle head-on the propaganda that tries to pit one group of low paid workers against others because they’ve won better pay. We should not be apologising but shouting loud that the way to better pay is to be in a union and challenge that race to the bottom too. 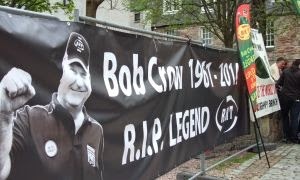 RMT members carried the tribute banner to Bob Crow they had carried in London and will carry in Glasgow on Sunday. 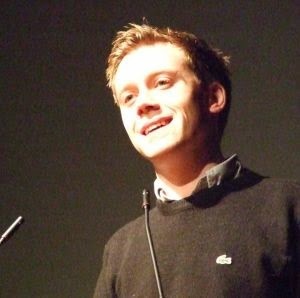 Owen slammed the politics of envy that scapegoats those on benefits and pits those in poverty in work against the unemployed while austerity makes the richest richer by an amount that could pay off the national deficit. A politics that scapegoats immigrants. It is not the poor or ‘Polish fruit pickers’ that are causing the poverty, low wages and a housing crisis, it is “the banks and the private landlords”, said Owen. “The reason wages are falling is because of the battering unions have suffered”, Owen said and the message needs to get out that organising is how eveything has been won. “We need to give hope from our history. Nobody gave us anything. Everything we have achieved has been won through the struggle and sacrifice of our mothers and fathers and grandmothers and grandfathers”, said Owen.